Happy Three Clover Thursday, thanks for stopping by! This week Kerry issued the following challenge Blue, White and Silver. Very fitting for the holiday season, don't you think! I used the Antique Glimmer Technique with the Our Daily Bread Designs new December Release, Peace & Joy. I love the beautiful snowflakes in this set, and the wonderful sentiments. 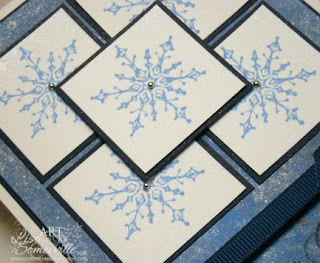 I used Pearl Glimmer Mist for the Antique Glimmer Technique, the snowflakes are stamped in Brocade Blue Ink, I popped the middle panel with dimensionals and added a Half Silver Peal to the centers. Looking for more inspiration using these colors, click on the Three Clover Logo on my sidebar to see what Kerry and the other Challenge Members created this week. Stop back tomorrow for Bloggers Challenge - Birthday Theme challenge this week! 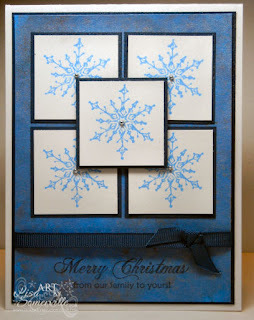 Perfect color combo for those snowflakes, luv the layout! What a cute card, I just love the snowflakes. Thanks for sharing your talent and caring spirit. Beautiful card, the colors are gorgeous as is all the shine of it. This is splendiferous for sure!! Beautiful! Love the shimmery look your snowflakes have.